When choosing from thousands of apps in the Apple App Store, Guerrilla Bob has one distinct advantage: it has an awesome name. Once downloaded, Guerrilla Bob doesn’t disappoint. From its great opening sequence to its intuitive gameplay, Chillingo has created a terrific third-person shooter. Guerrilla Bob lets you encounter adorable soldiers and then blow them up. Guerrilla Bob is a dual control shooter – think of it as a cartoony version of Call of Duty: Modern Warfare. Bob, a short, stumpy soldier with a Rambo-like attitude, can go anywhere in his 3-D world and shoot anything. The game starts out with a bang thanks to a fantastic opening cinematic that is reminiscient of a scene from "Tropic Thunder." The easy version of the game has a nice slow learning curve, allowing you to get a handle on the controls while pitting you against only a few enemies at a time. The first half of the beginning level serves as a very effective tutorial for the rest of the game, but isn’t frustratingly easy if replayed. As you go through the levels, new enemies are actually introduced to you, names and all. Each enemy tries to thwart Bob in a different way: thrown bombs, suicide attacks, flamethrowers—you name it. There are multiple versions of each type of enemy, so you learn to know what to expect and what strategies to use to kill each type of enemy. 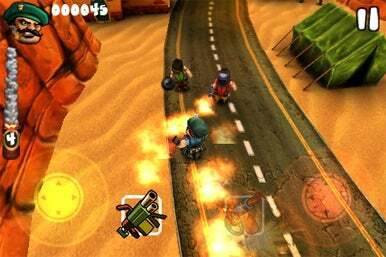 Most of the game takes place with Guerrilla Bob running down a road lined with buildings, but the road is very wide and there are plenty of nooks and crannies with hidden prizes and enemies that make the game map feel fuller. The effects and explosions look great and there are times when Guerrilla Bob really shines. I was especially a fan of moments when you just get to mow down incoming enemies running in from all directions. You can almost imagine the cartoon sweat dripping out of his beret while he grips his cartoon rocket launcher and smokes his cigar (which he does the whole game). You can save up to four different games so you can let someone else try the game without ruining your personal saved game. That's not to say the save system is one of the game's strongsuits. If you run out of lives, you can’t go back to your saved point. The game is over and you have to start from scratch. With escalating difficulty levels, tactical challenges and almost instant pick-up playability, Chillingo Ltd. and Angry Mob Games have really created a winner. If you haven’t already picked up Guerrilla Bob solely on the name, I suggest you do so for the stellar gameplay.